This wedding was adorned with a Teepee and lace. In a backyard, little pots held each succulent in place. and feathers delicately placed with purpose and favor over desert cookies and cupcakes. Sage, peach, and creme colors created the theme. a tearful vow exchange and prayers of thanksgiving. Waffles and Greek cuisine.Kids and simple things. High heat did not stop them, as they were proffered wedding blessings. Hopes, dreams, and wishes. A lavender farewell. With Bohemian touches, no veil as well. The couple posed lovingly and bade us goodbye. This wedding is one for the books. There were details galore and in them, so many cute touches that made this a photographer's dream wedding shoot. How could you not fall in love with the tiny little cake? 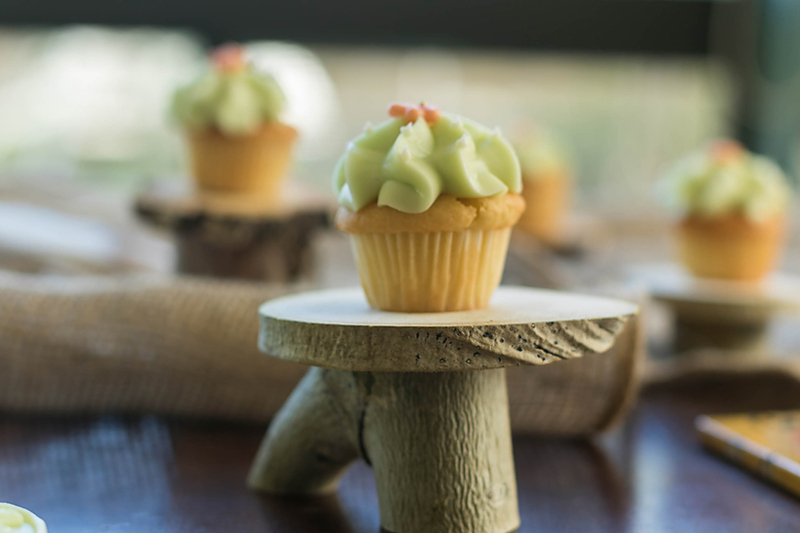 It was made by The Sweet Tooth Fairy along with the mini desert succulent cupcakes and cactus cookies. They did an amazing job! The lace teepee from Top Notch Rentals was placed under a tent provided by Scottsdale Stretch Tents. The inside was draped with beautiful florals that simultaneously seemed natural and magical! how could we forget the wedding bouquet? 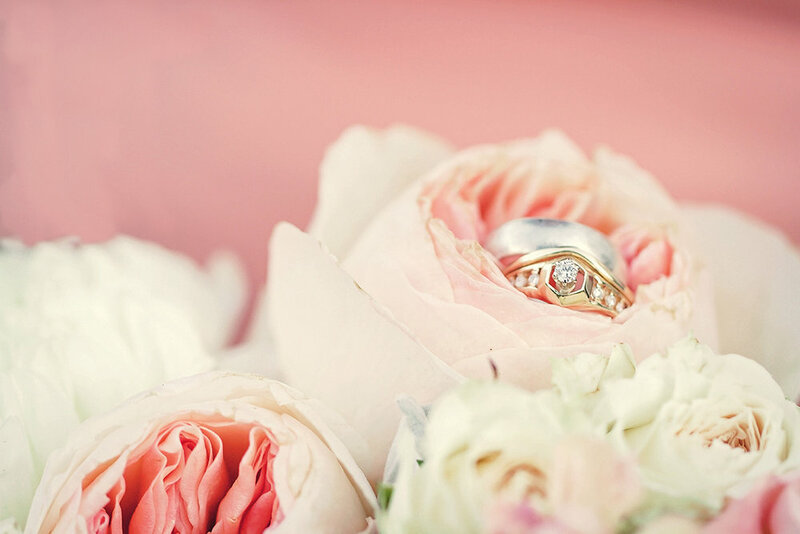 Zuzu's Petals did such an exquisite job of bringing all the flowers up to par with the rest of the wedding details. The Superstition Mountains were an amazing backdrop for the bride and groom session during our wrap up. This wedding was one of the prettiest I have seen! The details, the love, and the people made it a wonderful event to be a part of. Native Texans Chris and Cecilia are a match made in Heaven. I was thrilled when they requested me to do their engagement photos. I have known Chris and his family for many years, it was such an honor to be asked to photograph their engagement and upcoming wedding. Currently stationed at Tinker Airforce Base they decided to their engagement photos in Oklahoma with their wedding to follow in Texas. They had a brief list of must-haves given to me before the shoot. This list included a photo with Chris in his uniform and outdoor scenery that showcases the couples love of nature.. Their wish was my command. Cecilia has a great sense of style and was a natural model for my camera. In fact, both members of this couple were akin to professional models. We started with the military uniform photos and then changed clothes to shoot outdoors. The locations and weather worked wonders together on this beautiful day. The sun definitely made its appearance bringing warm golden rays that stretched across the fruited plains. This may be one of my favorite shoots I have done. Cecilia is going to make a beautiful "Wildflower Bride," I look forward to watching them say their "I Do's" in a tiny town in Texas surrounded by their families and loved ones. What separates a normal girl from an Austen Aficionado? Is it the hair, the dress, the accessories? Nay, I say it's forever and always the story. I came to love Jane Austen's books late in life; not being refined in the nature of my readings. Old books never lured me to open them. Until one day, I was introduced to the BBC version of Pride and Prejudice . The author, the book, the movie all became front and center, and from that moment I knew, I wanted to do a shoot based on those things with a spin of my own. Pride and Prejudice is based on the inner workings of the Bennet Family, especially the 3 main sisters: Jane, who is oh so beautiful, Elizabeth the oh so witty, and Lydia who is just silly. The story is set in the English Countryside, at various mansions and amongst many a party. The drama escalates as each character makes choices that effect themselves and their family. The overall story among sisters is never really told, but you can gather little odds and ends of their feelings through their interactions. Enter me. I wanted to showcase a shoot that tells the story of what it might have been like to be a Bennet Sister. In my point of view, these girls were closely connected. like a mixed bouquet of wildflowers, each sister portraying a special personality that was unique on it's own, but accenting each other perfectly when all together. Jane, our beauty without fortune , is a mother hen to her youngest sisters. She allows herself to get caught up in their silliness at times, and is very close with Elizabeth to whom she is closest in age. You couldn’t find more sillier sister than Lydia and Kitty These girls are their own best friends and worst enemies. They tolerate their older sisters mothering, and Mary's disapproval, but when it's a regiment soldier, or dancing, these two girls err on the side of being inappropriate. Last but not least, Mary. Painted as a sever character in the book and movies, I opted to soften her somewhat. She is well-read in everything chapter and verse. She has a brilliant mind, and is shocked at Lydia's and Kitty's antics at times. She isn't much to socializing but will do so at her sisters request. She loves "cover-sating" with Elizabeth, as she has a mind that Mary can respect. This shoot wasn't about the bells and whistles, but more about the relationships. The story behind the story. It's also meant to inspire. A Jane Austen Inspired Session "The Bennet Sisters"
JD Covert from Zombie Scouts highlights some of the prep work that went into the styled shoot of The Bennet Sisters. May the fourth be with you! This is a continuation of the Rey shoot I released last year after the Force Awakens was released. This post is dedicated to Carrie Fischer as the first leading lady in the Star Wars Universe. This shoot was a birthday gift to my youngest daughter. 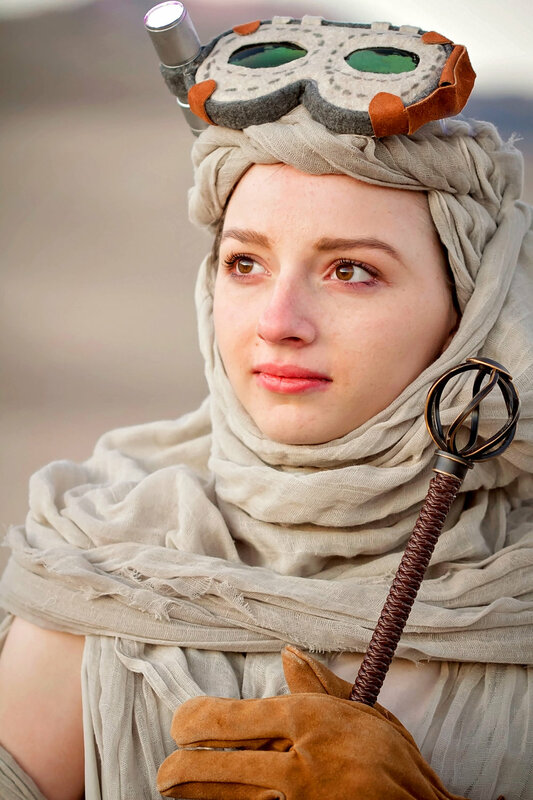 She is a HUGE Star Wars fan and supporter of the newest Star Wars character, Rey. We traveled to Colorado armed with a tiny budget, creative costumer, adventurous teen, and a crazy mom-tographer. The mountains of Colorado were not prepared for our quirky shoot. The various terrains of Colorado provided a perfect backdrop for this shoot. I wanted to make it look like a film out-take. It was a fun session filled with a life time of memories which, if given the choice, I would repeat time and time again. This shoot challenged me in ways I did not expect! I had to shoot in freezing temperatures, glaring sunlight, and steep rocky terrain. I realized these challenges were for my good and I should continue seeking out them out to better my own technique and effectiveness as a photographer. I am grateful for my creative spirit being the driving force of my work instead of logical doubt. Without such passion I could only wish to do that which many photographers dream about. I love doing styled shoots because they demand more out of me than a typical family, senior, or wedding photoshoot does. It pushes you to think outside the box with the only limits being your imagination. One is not hindered by client expectations or the critiques of bystanders during these sessions. It is just the photographer, a camera, and an idea. I hope this project will encourage other photographers to do styled shoots as well. It is a nice break from the norm to expose our creative side that we have restrained or hidden due to the fear of failure. I think art is an expression of yourself used when words are not enough to convey your message. I look forward to more of these projects and encouraging clients to step into a styled shoot for a lifetime opportunity. Anyone can get a western saloon token photo from a theme park, but few can say they posed in a story that portrayed their own interests and individuality. The Atwood's waited eagerly 1 year for their dream wedding. The bride is the sweetest girl you will ever meet and was accompanied by an amazing girl squad that happily helped with decorations and straightening the bride's gown on her big day. The groomsmen also pitched in with full support of the groom's life-mate. Even though the weather was a little crazy, the wedding party carried on without a care in the world. We might not have gotten the "perfect" sunny day, but these two were surrounded in priceless love from all who attended. I have been spoiled with yet another awesome bride and I hope that I will have countless more like Mrs. Atwood. Congratulations newlyweds! May your years be plentiful, may favor find you wherever you land, may you always remember the love and promises that will be the foundation for your future. Star Wars Styled Session "The Force Awakened through Reys eyes"
I have normally photographed stylized sessions for a wedding or a high school senior. I love going beyond the traditional propped and posed event photos and instead showcase a story line. These are often inspired by films, books, songs, or are products of my own creativity. My latest project is launched on the premier of " Rogue One " ! In celebration, I want to share the first of a two-part themed shoot with you! This photo session was inspired by" Star Wars--The Force Awakens". I have a daughter who is a raving Star Wars fan and is absolutely enthralled by the recent film. For her birthday I wanted to gift her with a special session inspired by her love of Rey, the main character of the new film. This shoot was challenging. 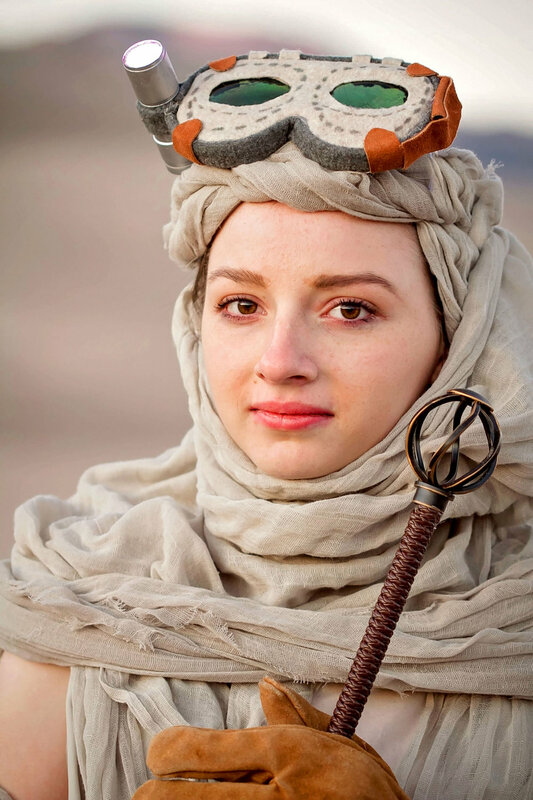 We faced the struggle of a tiny costume budget, difficult location scouting, and even the cold temperature to fully capture the story of Rey. 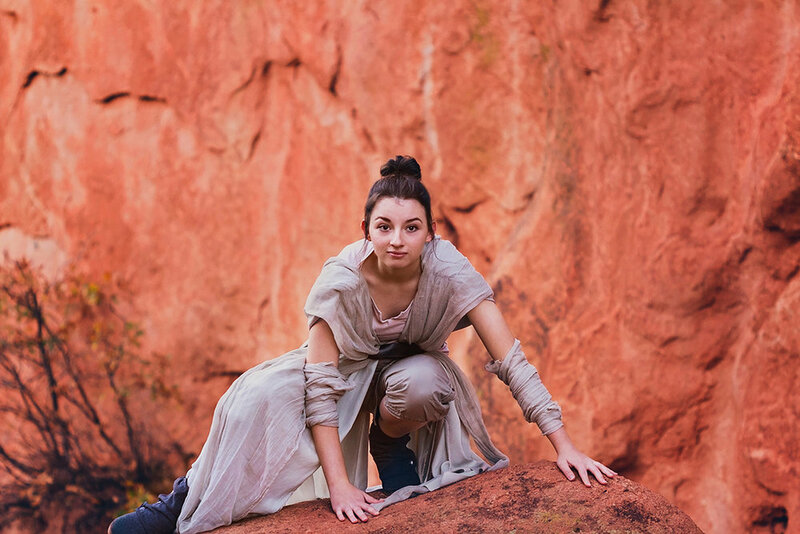 I coordinated with afriend on how to recreate the Rey costume on a tiny budget. One can buy a Rey Halloween costume but it doesn't have the authenticity of a home-sewnand customized ensemble. I wanted to capture the character by gathering items similar to what she wore in the film and embracing the raw qualities of her scavenger lifestyle. This means most of the clothing was loose-fitting, tattered, mismatched, and a little dirty. I loved all the cultural and regional differences of the Star Wars universe displayed through Rey's clothing. To recreate this look I used fabric and clothing patterns from "Jo-Anne's," random collectibles from thrift stores, and some items from Walmart. My seamstress friend and I constructed Rey's outfit by hand. We draped, pinned, stitched, hot glued, and spent several hours to completing the scavenger's apparel. I hope you enjoy Part One of "The Force Awakened through Rey's eyes"stylized session and be ready for Part Two to be premiered at the start of the New Year! Listen to this Rey's theme song, it enhances the experience ever so much! Silver Screen Sessions are something I love to bring as an option to my clients, be they Seniors, Families or Individuals looking for something unique I deliver creativity thru a variety of ideas some of which are film based. 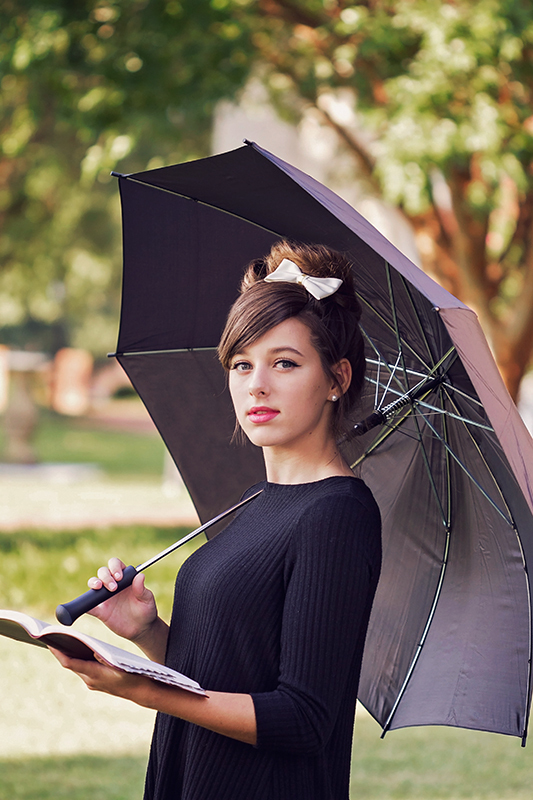 This styled senior session was crazy fun to do. 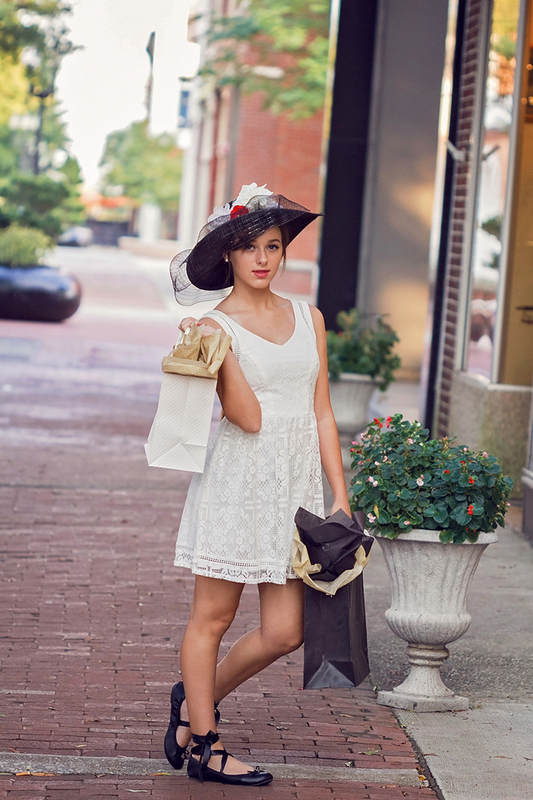 With the help of one of my sweet friends and her family this shoot had detail, elegance and style. I hope you will enjoy our Audrey Hepburn Silver Screen Throwback. I'll be dancing through the night"
I love working with kids, partly because I believe I must be one myself. I love their imaginations, and the things that are precious to them. Being around them makes you forget all the negative moments in the world and you get sucked away to a place you can't name but you know you don't want to leave. That's exactly how this adventure with my sweet little client began. Whilst visiting her family, she was my second hand prepping for her families sessions. She was at the ready to help me with whatever I asked, and also mothered me to take care of myself when I ran short on time. During my stay we watched some of her favorite movies, and of course Frozen was one of her all time favorites. Well I couldn't just "Let It Go" I wanted to do something special for her. So with the help of her mom, I created a moment" Frozen in Time" just for her. Let kids dream, let them play and let us not forget what it's like and join them. 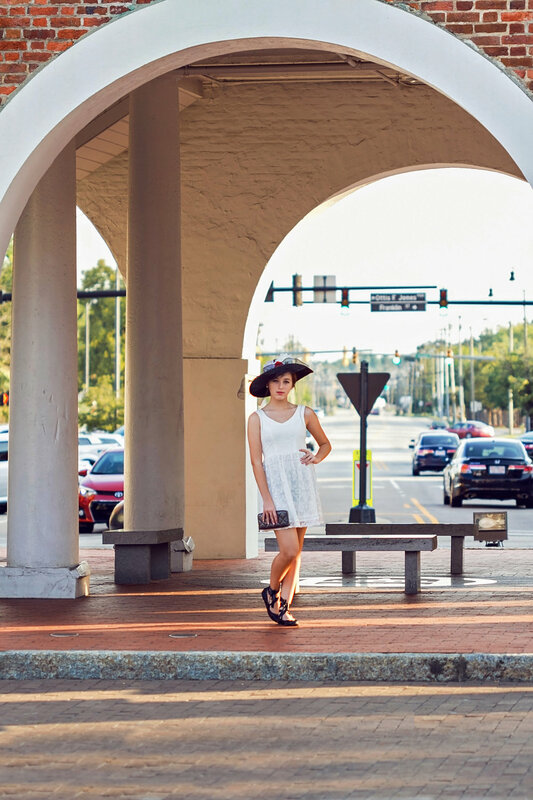 Confidence, Beauty and Fashion all come together on this Urban Senior Session! A magical Sunday afternoon in Medicine Park, Oklahoma at The Music Hall was the backdrop for Ashley and Kevin's "Simply Sweet" wedding. The sun broke thru the skies on a slightly overcast day making them appear to glow during this outside portrait session. Ashley's colors for the wedding were various shades of purple and gray. Each bridesmaid wore a different dress that fit them to a "T". The groomsmen kept it casual with assorted purple ties, white shirts, and gray slacks. Ashley has been planning this wedding for months. From the ring box her grandfather made, homemade boutonnieres,and bridesmaids florals to the garter that she would wear down the aisle. No detail was left out. A Wedding box Event Planners helped make Ashely's vision complete with tables draped in purple and white silk scarves, shimmering with floating candles, and a decoratively submerged lily. The Plantation Inn Restaurant catered the wedding meal and after the vows were said, photos were taken to capture this wonderful moment, with the reception shortly after. The DJ played sweet tunes until the last candle was blown out. This couple had the sweetest family and friends, no matter what little bump happened that day, they plowed forward like champs. These two have to be the cutest couple ever and I wish them all the best as they take the next steps of life together. Congratulations to the newly-wedded Stiebs! On a beautiful day in December, in the quaint and historic chapel of Old Trinity of Paseo Church , Hailey (a lover of all things cute and vintage) and Vincent (formally known as Luke by his family and a lover of everything involving books and maps), came together to become Man and Wife. A vintage dress and specialty hand made veil by Marina Marsili Veils gave the bride a ethereal look. Stacy, Hailey's mom, along with friends and family gathered many an antique to give the wedding a very a historic feel. 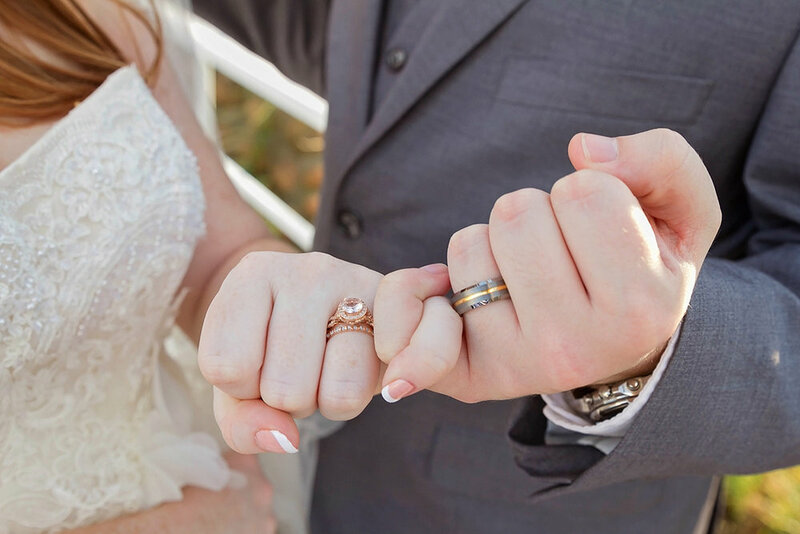 From old typewriters, to suitcases, books, and broaches this wedding gave a nod to the past as well as embracing their future. The ladies of Simply Sisters took all the families items and created a beautiful backdrop for this bride and groom to say their vows. The bridesmaids were attired in soft coral chiffon gowns with a simple strand of pearls and baby's breath bouquets. They stood proudly alongside their groomsmen counterparts who all were likewise well attired in sleek, black tuxes with coral orange vests and bow ties. The reception was kicked off with a flower petal faux-exit so that all their guests who were leaving early could be a part of their goodbye. The families brought their favorite signature desserts and a hot cocoa bar was offered to warm up any chilly guests. The showstopper of the day was the creation by Amy's Cakes .Wrapped in white fondant, edible book pages, and flowers this cake was perfectly vintage and ready to be admired. Amy's Cakes really out-did themselves with all the detail. This wedding start to finish was all about traditions, family, comfort desserts, and beauty. It was a privilege to be a part of this wedding and share in the memories that really will last a life time. Wherever I go I meet and work with really neat people. This week on the blog it's dedicated to my friend Ann. I thought I would do a little Q & A with Ann so that you can get to know her and see what makes her more than meets the eye :). Me: Ann, tell me a couple of things about yourself? Ann: I am the second oldest of 5. I was raised in a military home, spent 4 years in the military, married my college sweetheart, and now we have 7 children and one grandchild on the way. I love to meet people and connect with them. Me:What kind of businesses are you involved in? Ann: I am involved in two businesses. I am an Independent Damsel Pro at Damsel in Defense and an Independent Distributor of Young Living Essential Oils. To me both companies are about families and helping them. Me: What kind of business is Damsel in Defense? Ann: Damsel in Defense is about equipping, empowering, and educating women to protect themselves. All of their products are focused on keeping women safe. Damsel in Defense has pepper sprays, stun guns, emergency kits, alarms, etc. Me: Do you have a favorite product that you love for Damsel? Ann: Wow! That is a hard choice since I like MANY of the items that Damsel sells. One of the most useful products is the Road Trip. It is an emergence auto tool. You can use it as a flashlight or a beacon. You can press a button to emit a high pitch alarm. It has a seat belt cutter on it and it can break a glass window should the need arise. Me: Why did you choose to get head shots done? Ann: First impressions make a difference. When I look at a business, the first things that I am looking at are the pictures. What does the business look like? What does the person involved in the business look like? We live in a visual society…if they don’t like what they see…they will move on…. I wanted pictures that showcased the best of me. I couldn't have agreed more. Your photo that represents your business is worth a million words. It lets people know how serious you are about what you do. So if you are looking to take your business to the next step I would love to be the one to help get you there! If you would like to find out more on Young Living Essential Oils, or Damsel in Defense You can find Ann's companies on the internet and Facebook. In closing, what makes Ann amazing isn't just her back story, it's how she is tackling her "now " story. It's hard to be just a mom, and just a wife, but running to successful businesses to boot and do all the rest? That's amazing to me! Had a sweet maternity session with this couple awaiting their first child a little girl who will be named Alice. I hope you enjoy their photo moments "All in the Golden Afternoon". As a photographer, I travel all over. I had such a time shooting this session with some amazing seniors out of the Dallas /Ft. Worth area. If I were to entitle this session with a song it would be "Sweet, Sweet the Memories You Gave To Me". A shout out to Hunky's Old Fashioned Hamburgers in Dallas, Tx for allowing us to shoot around their location along with the Eagle Crest Limousine Company. Styled Sessions are a passion of mine. I love when my clients want to do something a little different, it allows my creativity to run wild. I hope you enjoy a few sneak peaks from this retro vintage session! Babies are absolutely wonderful. I am always amazed at these tiny little miracles. Birth Sessions are a little different than normal photography sessions; they normally take place in a hospital, they can happen any time, the space is small and sometimes dimly lit, and the event carries a multitude of emotions. I wouldn't miss it for the world. Watching these little ones take their first breath, the faces of the parents meeting their new little wonder, the little feet being coated in ink and stamped on the birth certificate. the tiny hat , the snuggling, the first feeding, the first bath not to mention the lamb cry that escapes our newborn as they greet the world. Being able to capture those moments in time through pictures, is what I love to do. Tricia a fellow photographer with Labyrinth Productions, had asked me early in the season to be there with her and her husband Marcus for the birth of her fourth and last child. I had taken Tricia's maternity pictures in the spring, so when the chance came to be there for their last little one, I was in. The day finally came for baby Kai to make his entrance. I had been there for hours watching my friend go thru the pains of labor, tears, laughter. It didn't seem like Kai was in any hurry to make his appearance; but at 9:31 a.m. he entered the world. At a whopping 5lbs 14 ounces. Believe me when I tell you he didn't come silently, he let the whole room know he had arrived. Mom and Dad were exhausted, thrilled, and misty eyed as they greeted their beautiful little one. In the all the activity, time seemed to stand still. I watched him get measured, taped ,bathed, fed, oohed, and awed over. I think momma is going to have a little heartthrob on her hands. I am so happy to have been able to be apart of this beautiful day. I am overjoyed for my friend Tricia and Marcus, and the rest of their kiddos, her daughter Tessa and sons Levi and Rune. Kai made the perfect addition to this sweet little family. Welcome to the world Kai! I can't wait to see what great things you do! One of my specialties are photographing seniors. They bring their own story, style and ideas to their session and I wouldn't have it any other way. On Megan's session the weather was overcast and foggy. What might be a misfortune to some is a perfect recipe for beautiful pictures. You may not get the sun flares, blue skies and golden lighting, but the fog and mist bring a magic to a photo that the sun just can't touch. When you have a portrait session its always better to be over prepared than not at all. With that said, I want to applaud Megan for being the perfect client of preparation. She came ready with colorful outfits, a leather jacket and her sweet dog Will. She was a joy to work with. Without further ado ,Buzy Bee Photography presents ..." Megan in the Mist". Military homecomings — the joy of a family reunited after months or a year of separation. Last fall, I had the privilege of photographing one such reunion for a very unique couple. 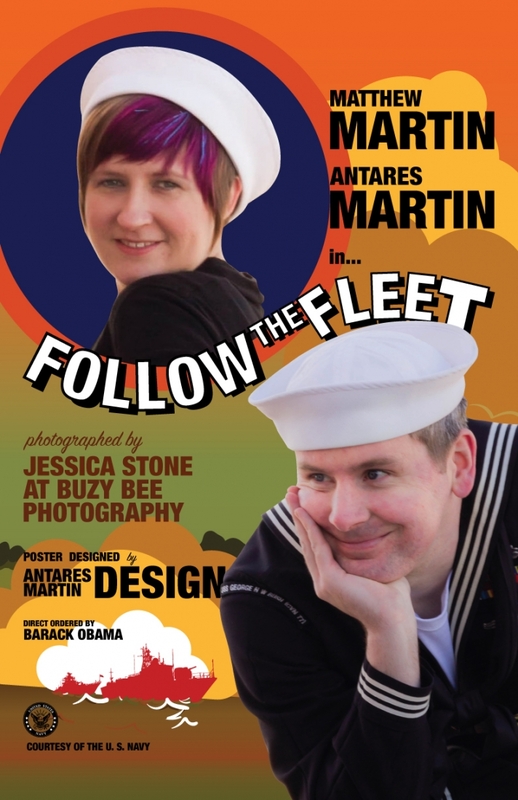 Antares Martin, a graphic designer for Antares Martin Design, asked me to photograph her husband’s homecoming. She and her husband have known each other for ten years and will be celebrating four years of marriage this Thursday? During that time, the couple have been through their share of deployments. Antares believes there have been between 3-5 deployments that lasted for 3-6 months, but this deployment was the longest at 9 months. Just two days before her husband deployed, Antares lost their planned pregnancy. The couple had no choice but to grieve separately. She was also in her last semester of college. What a perfect homecoming it was for the sweet couple! We did a candid homecoming session with a few poses at the end to fulfill Antares movie poster wish. I asked if she had any words of wisdom for those going through deployments to add to this blog. Meeting and working with Antares was a pleasure. If you would be interested in having your photos turned into a movie poster moment feel free to visit her webpage Antares Martin Design . 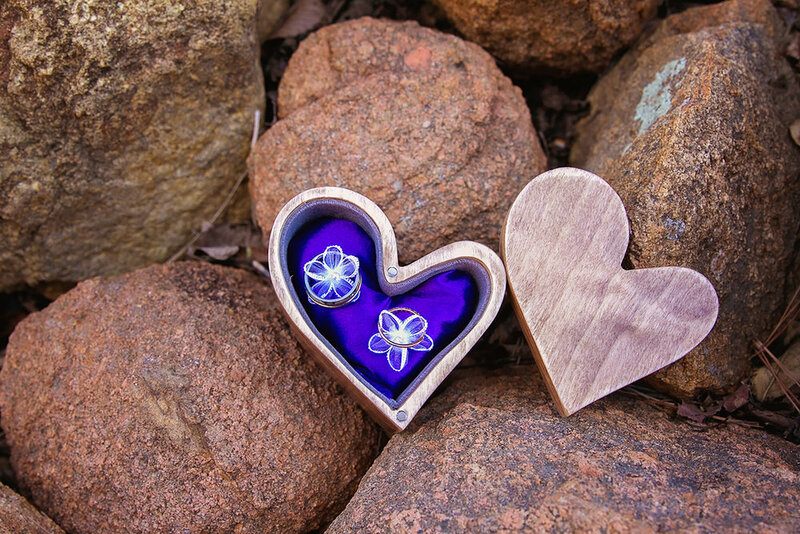 She or someone in house can help you create a piece of art that encapsulates a joyful moment. I don't know about you but here at Buzy Bee Photography it's been, cold, snow, ice, gray, rain and then snow, and ice all over again. Not the easiest weather to work in, but snow pictures are a favorite of mine. So without further adieu I would share my newest shoot called "Mother Natures waits for Spring". We took a snow laden ed day, clothing and material I had used for plays and past shoots, and created a sweet vintage shoot that warms the soul. I hope you enjoy it and instead of waiting on weather to do the right thing, why not embrace it for a one of a kind unique shoot?